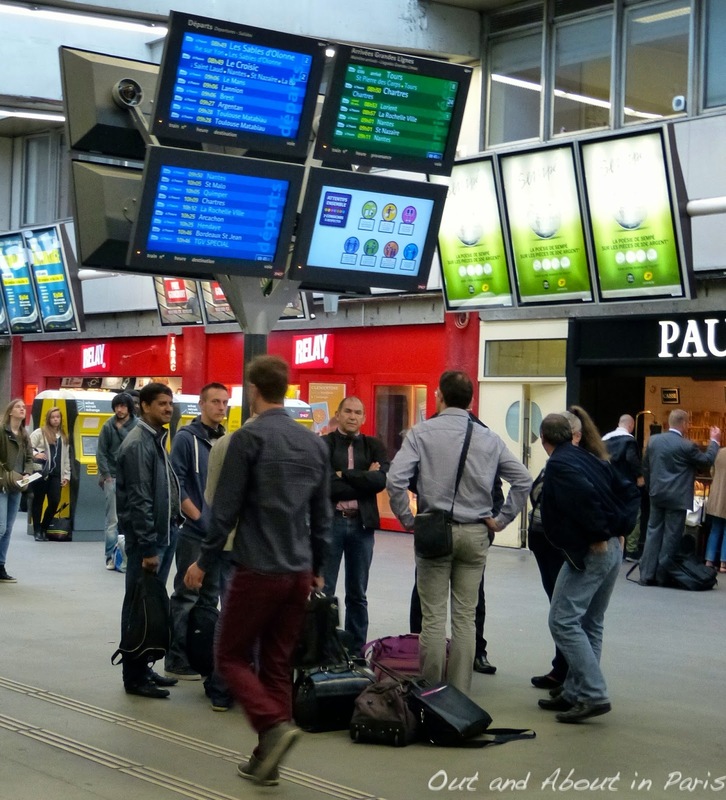 Don't let a pickpocket or scammer spoil your trip to Paris. Some tips for staying safe. 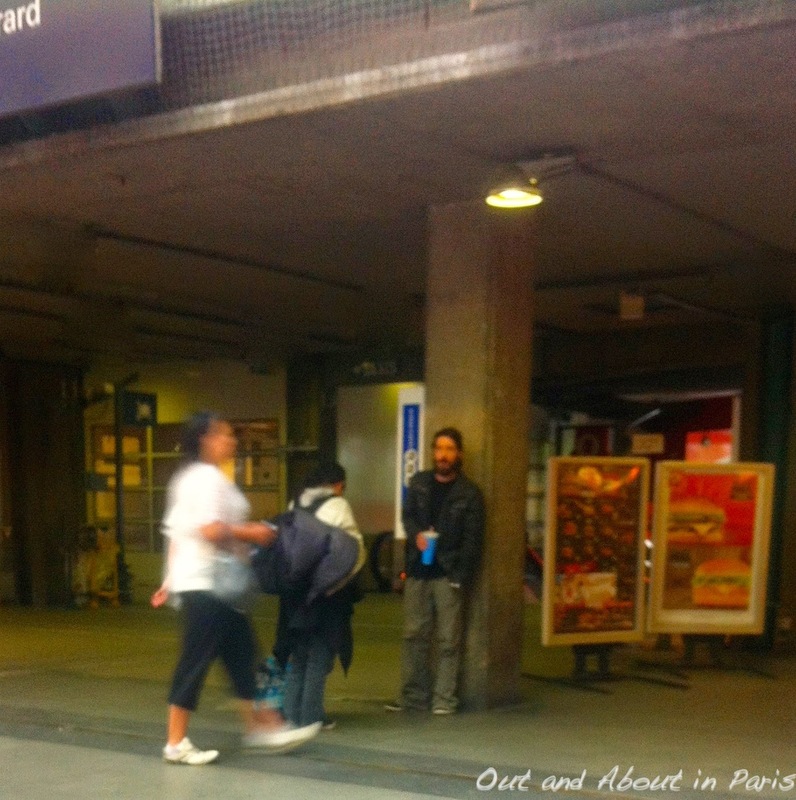 Working as a team: the spotter at Paris Montparnasse and the young woman with the sleeping bag. Paris is a wonderful place to visit. But, it's also a big city. By definition, that means that you have to be on your guard. Always. I was recently reminded of this when I arrived at Paris Montparnasse train station flustered and worried that I would miss my train to the Loire Valley. After grabbing a quick cup of coffee and afternoon snack to bolster my flagging energy, I placed my purse somewhat haphazardly on the bench next to me. Within seconds, a young woman with a large sack and rolled up sleeping bag was by my side. Feeling an instinctive warning tingle at the back of my neck, I resolutely moved my purse to its normal place. Securely on my lap. Wondering if my suspicions were correct, I followed the woman with my eyes. Not surprisingly, she rotated towards a man standing with his back against a large cement column. He was her spotter -- surveying the busy train station and almost imperceptibly directing her towards their next victim. Most harried travelers would never have noticed him. It made me furious that he had selected me as an easy target. In retaliation, I snapped a photo of him with my phone. When I found myself with some extra time at the train station the following week, I decided to do some spotting of my own. The first thing that I noticed was a group of businessmen standing in a circle with their bags placed carelessly on the floor behind them. The unfortunate experience of having my wallet stolen while dining with friends has taught me that thieves are fast. It only takes them a couple of seconds to relieve you of your wallet, laptop or other valuables. I'll never forget the elderly woman who discovered that her wallet was missing after she sat down next to me on a TGV bound for Geneva. During the entire three-hour journey, she exchanged frantic telephone calls with her son while I tried my best to console her. Don't let that happen to you. Be aware of your surroundings. People have had their wallets stolen while riding the metro, dining in a fancy restaurant and looking at the Mona Lisa in the Louvre. Keep your purse and backpack securely next to you at all times. As in all big cities, there are scams in Paris. Some of the most famous ones involve gold rings ostensibly found on the sidewalk, petitions that urgently require your signature and bracelets braided on your wrist. Use common sense if someone approaches you on the street. If it feels like a scam, it probably is. If you hear a public service announcement about pickpockets on the metro, don't automatically pat the pocket where you keep your wallet to make sure that it's safe. A friend told me that reaction actually helps thieves who may be watching you. If you're visiting Paris, don't carry unnecessary items in your purse. A credit/ATM card, some cash and one piece of identification should be all that you need. Make a copy of your passport and the front and back of any cards that you carry. Do you have some more tips or a story to share? Click here to join the conversation about this post on Facebook. Read more: The bracelet scam guys near the Sacré Coeur funicular and A word of warning - keep an eye on your purse in Paris! Keep an eye on your bags. Never place them on the floor behind you! Knock wood. I'm glad you were keen to the danger. I remember your horrible story of having your wallet stolen, I feared we were going there again with this story. Yes, stay aware and stay safe. Really useful post, Mary Kay! Coming from NY I have this arrogance that it will never happen to me - but my phone was lifted out of my pocket au Louvre, Storsh stroller stolen right in front of our fish mongers (a funny story I'll tell you in person) AND our flat was (violently) robbed the day after I got home from Buenos Aires (alone, Storsh and Hernan being in BA still). So that big town strtting indeed needs shedding! Hello! Thank you so much for your post! I am quickly realizing that traveling in Paris will be very different in comparison to being out and about in Los Angeles. I was wondering if you would be able to recommend which neighborhoods to stay in while in Paris. Thank you in advance! Paris is one of the most beautiful destinations. I have never been to Paris but now I am going on a Paris trip for 10 days with my family and I would definitely keep your points in mind before or after landing.